Thomas Gideon, host of The Command Line podcast, ends his show with the line, “Hack your world.” I love this way of thinking. I’ve always felt you should hack everything you own. When any electronics break in our house I might be upset because I have to replace it, but at the same time I’m always excited about the opportunity. Once something is declared officially dead and out of warranty, the screwdrivers and pliers are coming out. I’ve done this my whole life. As a little kid I found an old TV set in someone’s trash and took it back to my garage. My friends and I spent the whole day tearing it apart. That began a lifetime of tearing things apart. I wait until things are dead because I hardly ever get anything back together (at least in working order) and I can’t afford to bust apart perfectly fine brand new electronics just to see what’s inside. And unlike a Motie, if I have extra parts when I reassemble something it isn’t because I’ve improved the design. I’ve disassembled a broken Cuisinart (and saved the motor), Chrissy’s old Dell Axiom, most of the watches I’ve ever owned, etc. But hacking isn’t just taking stuff apart, it’s putting something to use in a way other than what the designer had in mind. That’s why I saved that food processor motor. It’s a powerful little motor and there’s all sorts of potential uses. And it doesn’t have to be an electronic device. The Hack A Day blog and Make Magazine are great places to get ideas for ways to start hacking your world. Anything is hackable. In fact, stuff you hack doesn’t really have to be a “thing.” Ideas are hackable. Media is perfectly hackable. I use the word media on this blog as a catch-all for movies, tv shows, books, podcasts, music, magazines – anything that entertains or informs and can be reduced to a stream of bits without losing its value. If you’ve spent more that 10 minutes of your life surfing the web you’ve run into hacked media. If fact, you may have even fallen prey to it. Remember this Photoshopped gem of a shark attacking a helicopter? Photoshopping images is probably the first form of media hacking most people are exposed to, but nowadays every form of media is being repurposed. All the required tools, which were once prohibitively expensive, are now freely available. For example, while a legal copy of Adobe Photoshop CS4 will run you $700, GIMP (GNU Image Manipulation Program) is free. You can even do image editing on the web now, with sites like Aviary and Picnik. Some of the coolest media hacks out there are mash ups. This is when someone takes two or more products and blends them together in a way that creates a new product. 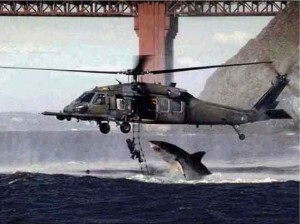 In fact, my photoshop example is a mashup since it’s a just an Air Force photo taken near San Francisco’s Golden Gate Bridge combined with a picture of a shark taken in False Bay, South Africa. Mashup Town is a regularly updated collection of popular song mashups I first heard about through the Daily Source Code podcast. Song mashups typically feature songs from two or three artists woven together and are labeled as Band One vs Band Two. For example, DJ Lobsterdust combined Faith No More – Epic, Queen – We Will Rock You, and ACDC – Back In Black to create “Faith No More vs. Queen vs. ACDC – Epic Black Rock” This sort of media hacking is pretty sophisticated, and requires a lot of time and some musical ability of sorts. Again, the tools (software) are freely available. Podcasting, blogs like this one, remixes on YouTube, ripping your CDs and DVDs to your hard drives, bit torrents, setting up media servers like XBMC – these are all media hacks. This is the new media, and in the new world we use our media the way we want. There isn’t a law that can be written or a form of DRM that can be created that can stop people from using media the way they want to. As long as there’s an analog hole your media is yours do do with what you will. I’m not going to get too into the legal issues involved in this topic today. That’s too big a topic and it pisses me off. For now let’s just say that most of what we’re talking about here is illegal unless you created the original media (as in took the picture, wrote the song, etc.) It’s a very complicated legal matter and it’s being fought out in courts all over the world right now. Most notably the guys behind Pirate’s Bay are currently on trial. Whatever the legal case may be, I say if you buy something you should use it however you please. If I buy a DVD and I want to watch that movie on my iPod I’m going to watch in on my iPod, DMCA be damned. These ridiculous laws are making criminals out of people who were just minding their own business trying to watch a movie they actually paid for. If you buy the last season of House on DVD you’re allowed to watch in your TV, but you’re breaking a Federal law if you watch it on your cell phone. How exactly does that make sense? And with the laws and the technology in place to make it harder for me to do that, exactly why shouldn’t I just go to ez.it and download the episodes for free? Eventually many big media companies are going to realize what the rest of us have already figured out – they are largely unneeded. Replaced by Blogs, Craigslist, and hundreds of news sites, the Rocky Mountain News closed its doors a few days ago. Which newspaper will be the next to go? The record companies are using their attack dogs at the RIAA to hold on to their business, and if you think about it, that really makes sense. I mean, what else can they do? What service does a record label provide any more? Is there even any reason at all to have record labels? Musicians can record their own tracks and distribute them electronically over the web, which is how we want them any way. In our house we’re becoming big Kindle users. As the popularity of e-book readers increases, what service will book publishers provide? I’d disagree just with books. There’s something aesthetically pleasing about holding a book in my hand that I miss when I read an e-book. That’s why I’d rather pay extra for the physical copy. I agree on a certain level. I’m reading a paperback right now and it does have certain advantages. For example the battery never dies and if I destroy it I’m not out $300. But change is inevitable. E-book technology will get better. We’ve just entered the second generation of mainstream e-book readers, and there are some slight improvements. Yesterday there was news that E-Ink (the company that makes the screens for Amazon’s Kindle and Sony’s Reader) has created flexible touchscreen e-paper. The popularity of e-books will continue to grow. Jeff Bezos (CEO of Amazon) is on a mission to make every book in the world available on the Kindle. The next few generations of kids will grow up on e-books the way the current generation of kids is growing up on the internet. They will grow up carrying entire libraries in their pockets. At that point book stores will be become specialty boutiques. There will be very little need for the book publishing industry. Paper books will likely become quite expensive. I don’t think I’m making any bold predictions here. This is just the natural path that innovation takes. We’ve seen it over and over for hundreds of generations. Even the current generation of e-book readers have too many advantages to ignore. Oh yah, I absolutely agree that it’s eventually going to turn out that way. And I’d definitely be all for using it, especially for college textbooks. But I still reserve the right to spend a small fortune on the paperbacks/hardcovers. A Kindle can’t replicate the feeling of walking into the Library of Congress and having books all around you and down every corridor. I’d miss that.